Aaron Snook operates a crank box as part of a toy theater production. Snook moved from Chicago to Asheville two years ago to launch a new theater company, the American Myth Center. 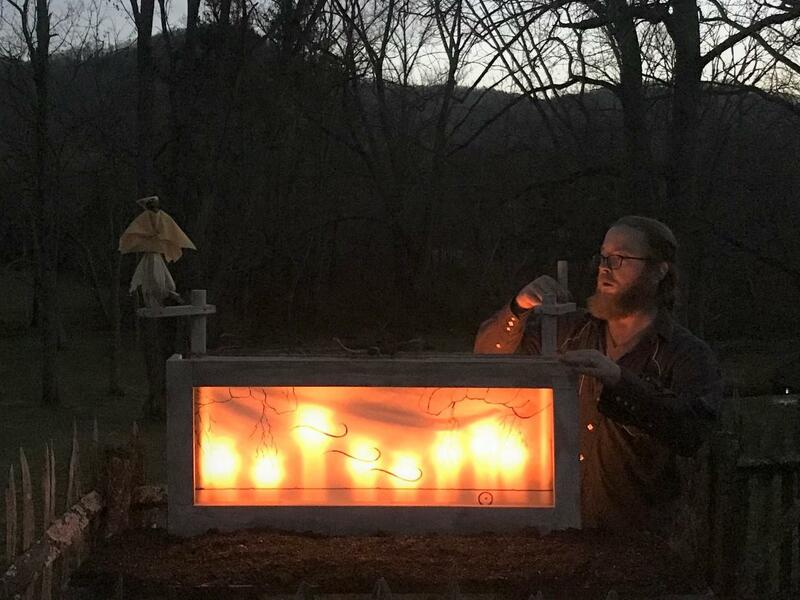 Not long after, he and his company received an early holiday gift: The manager of the Zebulon Vance Birthplace State Historic Site in Weaverville came to him with a concept, of adapting Charles Dickens’ “A Christmas Carol” with Vance stepping in for Scrooge. Performances of “An Appalachian Christmas Carol” are December 6-8 at the Vance Historic Birthplace in Weaverville, starting every half hour between 5:30 and 8 p.m.
“Even though we literally didn’t have enough time to do it last year, I had to say yes, because this is exactly the kind of work I want to do,” Snook said. The challenge facing him: Creating a story that didn’t sidestep the uglier facts of Vance’s life— chiefly, that the Confederate officer and North Carolina governor owned slaves. His answer came in the form of toy theater. Along with recorded voices and sounds, the lone live performer is a female tour guide, who leads audiences through and around the Vance birthplace home. Snook moves behind the scenes, from shadow box to shadow box, operating silhouetted puppets that illustrate the story. Snook collaborated with Kimberly Floyd of the Vance Birthplace to create a script that hews true to history while leaving the story open to creative interpretation. Rather than drill to finely into Vance’s history, the story spotlights the stories of some of those enslaved on the Vance property. Author Steven Nash is well-versed on Zebulon Vance, and the post-Civil War period known as Reconstruction when Vance became a U.S. Senator and political powerhouse in North Carolina. He wrote the book "Reconstruction's Ragged Edge: The Politics of Post-War Life in the Southern Mountains". The Vance Monument in Pack Square is one of downtown Asheville’s most recognizable landmarks. It honors Zebulon Vance, North Carolina’s governor during the Civil War and U.S. Senator during the Reconstruction period. It has stood for over a hundred years. But following the removal of Confederate flags and statues in Charleston and New Orleans, the discussion over the future of the Vance Monument in Asheville is becoming unavoidable. The city of New Orleans earlier this year removed statues of Confederate president Jefferson Davis and General Robert E. Lee. Asheville has its own monument to a Confederate leader – Zebulon Vance, who served as North Carolina’s governor during the Civil War and U.S. Senator during the post-war Reconstruction period. The future of the prominent landmark in Pack Square - home to two other monuments honoring the Confederacy - is now under debate, as is the lack of equivalent commemoration of Asheville’s deep African-American history.